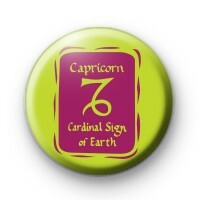 This is a listing for a 1 inch pin badge of the Zodiac Symbol for Capricorn. Its a bright green and pink and is ideal for people celebrating their birthday between Dec. 22nd - Jan. 19th. These make lovely handmade gifts and if you need a few more birthday badges we have a lovely selection in the shop.